Hollywood celebrities love this personalized piece. 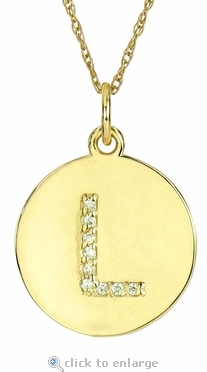 Our Vanity Tag Diamond Look Cubic Zirconia Initial Monogram Circular Disc Pendant is another take on an initial necklace pendant that is custom, personal, special and fun. 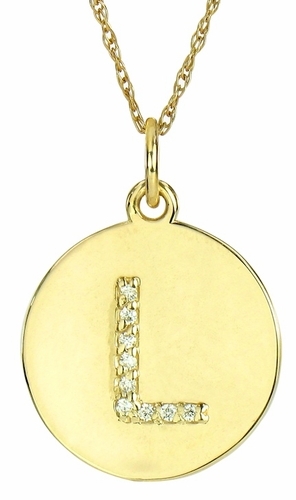 The personalized Vanity Tag necklace is a simple circular disc pendant that displays your favorite initial that is pave set and encrusted with the finest diamond look Russian formula cubic zirconia. Whether it's your first name initial or your last name initial or the initial of a loved one or child, you are sure to display it proudly with this delightful necklace. Makes for an amazing and thoughtful gift for a friend or loved one. Our diamond quality pave set Vanity Tag Initial Monogram Pendant measures just over half an inch in diameter and comes standard with a 16 inch fine rope chain. Shorter and longer chains available via special order. Each Vanity Tag Initial Monogram Pendant is custom made and hand set for each order and thus a Special Order. Available in your choice of 14k yellow gold, 14k white gold, 18k gold or platinum, see the menu options for details.